Global warming has been a hot topic of debate for quite some time now - Bottom line is; it's happening! That's wrong." - Anthony Cortese (co-director of the American College & University Presidents Climate Commitment, president of Second Nature and co-founder of the Association for the Advancement of Sustainability in Higher Education). According to NASA's Goddard Institute for Space Studies, the average temperatures have climbed 1.4 degrees Fahrenheit (0.8 degree Celsius) around the world since 1880. The rate of warming is increasing. The 20th century's last two decades were the hottest in 400 years and possibly the warmest for several millennia, according to a number of climate studies. The United Nations' Intergovernmental Panel on Climate Change (IPCC) reports that 11 of the past 12 years are among the dozen warmest since 1850. Arctic ice is rapidly disappearing, and the region may have its first completely ice-free summer by 2040 or earlier. 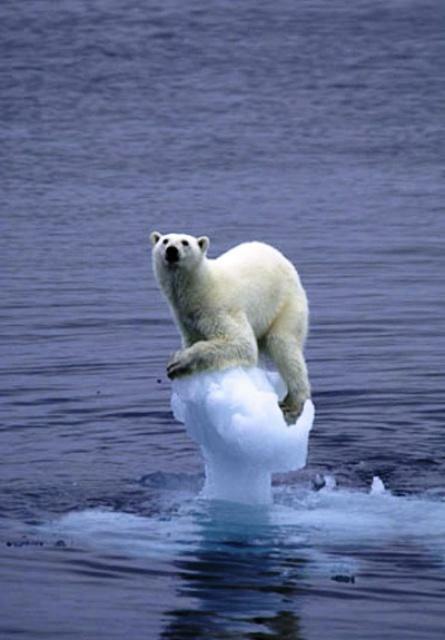 Polar bears and indigenous cultures are already suffering from the sea-ice loss. Coral reefs, which are highly sensitive to small changes in water temperature, suffered the worst bleaching (die-off in response to stress) ever recorded in 1998, with some areas seeing bleach rates of 70 percent. Experts expect these sorts of events to increase in frequency and intensity in the next 50 years as sea temperatures rise. Humans are pouring carbon dioxide into the atmosphere much faster than plants and oceans can absorb it. These gases stay in the atmosphere for years, meaning that even if such emissions were completely stopped and eliminated today, it would not immediately stop global warming, much less reverse it. 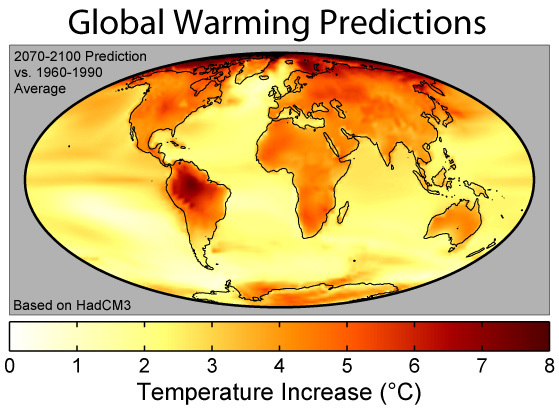 So, what are some of the most likely Global Warming Effects? A follow-up report by the United Nations' Intergovernmental Panel on Climate Change (IPCC) released in April warned that global warming could lead to large-scale food and water shortages and have catastrophic effects on wildlife. Sea level could rise between 7 and 23 inches (18 to 59 centimeters) by this century's end. The IPCC report projects that a rise of just 4 inches (10 centimeters) could flood many South Seas islands and swamp large parts of Southeast Asia. In the U.S., Louisiana and Florida are especially at risk. Severe weather and Weather Hazardssuch as strong hurricanes, droughts, heat waves, wildfires, and other natural disasters may become commonplace in many parts of the world. The growth of deserts may also cause food shortages in many places. The ocean's circulation system, known as the ocean conveyor belt, could be permanently altered, causing a mini-ice age in Western Europe and other rapid changes. More than a million species face extinction! All from disappearing habitat, changing ecosystems, and acidifying oceans. Some of these facts may or may not surprise you. Nevertheless, global warming is a environmental phenomena which will effect us all. To learn more, you may want to research some further Weather Report Tips.